Find hotel near Weser Stadion Or Weser St .. This is scenically beautiful sports complex situated on the north bank of Weser River. It is surrounded by greenery and is just about 1 kilometer away from the city center. 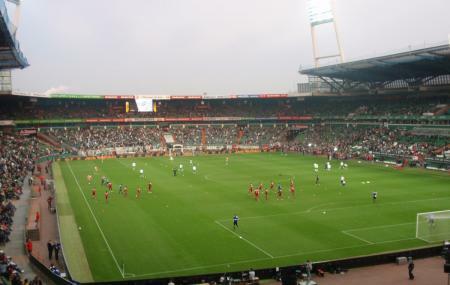 It homes the German Bundesliga club, Werder Bremen. It tried to bid to be the host city for 2006 FIFA World Cup but was unfortunately turned down. They have seen legends perform in their stadium, which include Bon Jovi, Michael Jackson, Depeche Mode, Metallica, The Rolling Stones, Guns N' Roses, Tina Turner and Van Halen, among many others. How popular is Weser Stadion Or Weser Stadium? People normally club together Historische Altstadt Bremen and Burgerpark And City Forest while planning their visit to Weser Stadion Or Weser Stadium.